The concept of continental drift first came to me as far back as 1910, when considering the map of the world, under the direct impression produced by the congruence of the coastlines on either side of the Atlantic. At first I did not pay attention to the idea because I regarded it as improbable. Map of supercontinent. From Science: A Four Thousand Year History by Patricia Fara. At the turn of the 20th century, the prevailing view of the Earth was that it was slowly cooling and contracting, and — like the skin of a rotting fruit — its surface was wrinkling to produce mountains and valleys. Over time, Alfred Wegener came to disagree, and to conclude that Earth's continents had at one time been joined in a single landmass, which he named Pangaea. 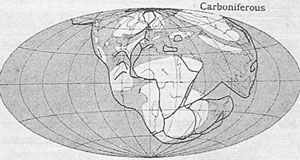 He further claimed that as continents moved around and smashed into each other, they formed mountains. It was an audacious idea, and geologists bristled with hostility. Wegener wasn't the first to notice how neatly the east coast of South America fit the west coast of Africa. Francis Bacon, Abraham Ortelius and Alexander von Humboldt all beat him to that. But Wegener devoted much of his life to assembling evidence for the fit. Wegener was an astronomer and meteorologist, so he was something of an outsider to the geology community. Few geologists of his day liked fantastic theories. At a time when many geologists focused on rock dating and fossil collecting, Wegener took the then-unconventional approach of seeing the Earth as a whole. Some geologists felt that his research was hasty and selective. Even worse, his ideas rang of catastrophism. Thanks largely to Charles Lyell, 19th-century geology had adopted the theory of uniformitarianism, the idea that the world we see is the result of consistent cycles occurring over vast expanses of time. Catastrophism, the prevailing belief before uniformitarianism — and one influenced by the Old Testament — argued that the world we see is the result of extreme events like worldwide floods and volcanoes. All the world's continents wrenching themselves apart from a single landmass would certainly qualify as a catastrophe. Although Wegener introduced his theory of continental drift in writing in 1912, and published his book The Origin of Continents and Oceans in 1915, his work didn't attract much attention until 10 years later, after it had been translated from his native German into other languages. When the attention did come, it was overwhelmingly negative. Wegener had the big picture right, but had difficulty proving it, and he sometimes had to guess at details. Some of his guesses were just wrong, such as the Earth's rotation pushing continents toward the equator. (In fact, there is such a propensity toward the equator, but the Earth's rotation alone is far too small to move continents. Arthur Holmes, who pioneered the practice of radiometric dating, proposed a more viable mechanism involving convection currents in Earth's mantle.) But well beyond the similar shapes in coastlines, Wegener did cite impressive specifics, such as diamond-bearing kimberlites found in both Brazil and South Africa. From "Fungus, Physics Explain Weird Tresses of Ice" in Eos . Photo by Gisela Preuß (some rights reserved). Americans were especially slow to accept continental drift. But in 1963, British geologists Fred Vine and Drum Matthews published their paper describing magnetic stripes formed at ocean ridges. What's more, on either side of this ridge were signatures of the north and south magnetic poles reversing themselves. Continental drift, supported by the theory of plate tectonics, gradually gained acceptance. Now geologists expect that, in another 250 million years or so, the continents will again coalesce into another super continent: Pangaea Proxima, or Pangaea Ultima. Unfortunately, Wegener didn't live long enough to see his theory accepted. In 1930, he embarked on an expedition to Greenland, planning to help establish a research station on the summit of Greenland's ice cap. Pack ice stranded his ship offshore, keeping Wegener away from land until the summer was half over. Once he finally did reach land, the combination of harsh conditions and overexertion caused his heart to fail. If Wegener was right, is uniformitarianism wrong? Uniformitarianism works, provided you extrapolate from a time span long enough to include 100-year (or better 1,000-year) floods, movement of continental plates and other processes too extreme to be considered "everyday." Uniformitarianism and catastrophism aren't that contradictory after all. Buried in the ice, [Wegener's] body has sailed westwards at a rate of about 2 centimeters per year on the back of the North American plate. He would have been glad to know that it will have traveled some 20 kilometers in a million years' time — in accordance with his visionary theory. The astronomer/meteorologist who radically changed the field of geology made other discoveries, too. In 1916-1917, while winter and World War I both plagued the border of France and Germany, Wegener made a discovery in the Vosges Mountains. 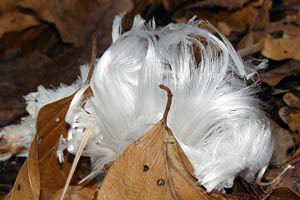 He found dead tree branches sprouting what looked like brilliant white human hair. The hair was actually super-fine strands of ice. The astute scientist also noted fungus near the hairy tufts, and speculated that the fungus in some way affected the ice growth. It took nearly a century, but scientists finally confirmed Wegener's hypothesis (in the absence of fungus, ice merely crusted the wood), and identified the responsible species: Exidiopsis effusa.